Contiweb successfully installed a new Ecoset dryer at GD Gotha Druck und Verpackung in Günthersleben-Wechmar (Germany) replacing their 10-years old TNV dryer. The replacement took place just before the summer and was achieved in only 7 days. During this period the existing dryer was dismantled, and the new one was installed and commissioned. 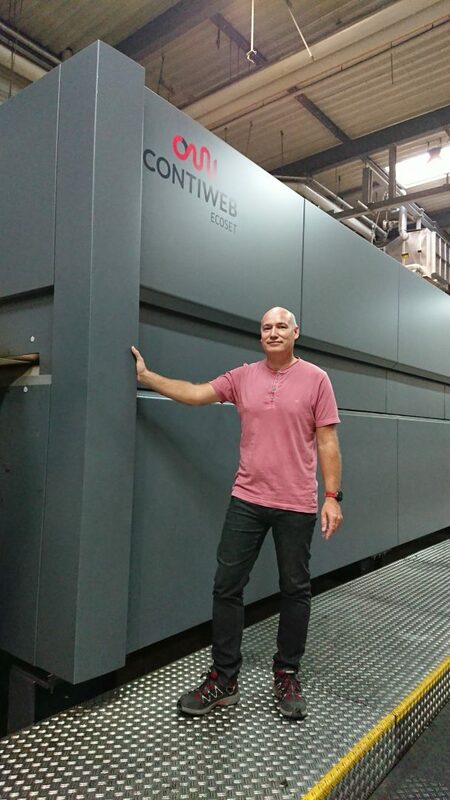 Mr Creutzburg (Director of GD Gotha Druck und Verpackung) was extremely happy with Contiweb’s performance: “This job was done beyond expectation and we could even resume production one day earlier than planned. Our Lithoman press is now ready for another 10 years of operating!”. The Contiweb Ecoset is an innovative dryer for web offset presses with the lowest energy consumption in the industry. The dryer exhaust can be reduced to a minimum due to a combination of technologies, such as the direct integration of the chills, extension of the drying sections and better control of cold and hot air flows inside the dryer. As a result, gas consumption is reduced by 70% and also electricity consumption is reduced significantly. Since the introduction in 2008 Contiweb has installed 90 Ecoset dryers. More information on Contiweb Dryers with integrated pollution control can be found here.